Speed isn't something that just... happens, it is a skill like any other, and it must be practiced. But how do you practice speed? Simple. Slowly at first, and then faster. The honest truth is that you don't need any courses to teach you to be faster. If you're motivated enough to practice every day, organized enough to track your progress with materials you make yourself, and can figure out what to play for your exercises, you'll eventually get faster. 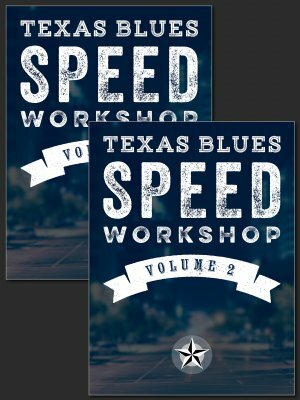 But if you're short on time, and you just want a guaranteed system that you can follow to build your speed, Texas Blues Speed Workshop is for you. This is a proven system for building speed for blues guitar. Players of beginner and intermediate skill level can start building speed in an organized, progressive way using Daily Drills, and Progressive Exercises. Includes all downloadable course materials for Volumes 1 & 2.